"I don't want to take £1 billion pounds to the grave with me." (Sir Tom Hunter, Daily Telegraph, 18 July 2007). Andrew Carnegie, Bill Clinton, Bob Geldof et al would no doubt agree that there can be only a small percentage of financial, business, sport or artistic successes in any one generation. There just isn't space at the top of any profession or vocation for the majority of the population. The system doesn't work like that. A pyramid requires a very broad, solid base made up of multitudinous blocks rising in successively smaller layers to the apex. The financial structure of the world is the same; the many enabling the few to amass their fortunes. In sport or art, whether through talent or promotion, a similar structure exists. Whilst the super-rich can afford to give away much of their monetary wealth without hardship or set up trusts, charities, concerts and the like to alleviate some of the world's worst conditions (and the rest of us can donate much smaller amounts according to our individual situation and whim), the plain facts are that each year, year in, year out, millions more around the world find themselves in abject poverty. Whatever is given in aid, grants or donations is never, and will never be, sufficient to "make poverty history". Sir Tom Hunter appears not at all gloomy about the world situation and claims "he gets a bigger buzz from a successful philanthropic venture than from his businesses". There is an obvious satisfaction to be gained from personally being able to bring positive solutions to problems of those less fortunate than oneself; however, even supposing all the world's billionaires were to prove as altruistic in ministering to the world's needy, it would only result in a partial cure of humanity’s sores rather than total elimination of the disease. The Daily Telegraph article ends with Carnegie's assertion that "all personal wealth beyond that required to supply the needs of one's family should be regarded as a trust fund to be administered for the benefit of the community." Which is not all that different from Karl Marx’s dictum “from each according to their ability, to each according to their need". However, the poor of the world don't need a hand-out. They simply need to be a part of a world system that doesn't exploit them and with the universal right to nutritious food and clean water, shelter, responsibility for self-determination, all long recognized as prerequisites for a fulfilling life. With "from each according to ability, to each according to need" applied globally it will not only be possible but achievable in the foreseeable future to eliminate poverty, malnutrition and the other ills inherent in global capitalism. When doctors, teachers, musicians, scientists, technicians, farmers, entrepreneurs use their expertise solely for the benefit of the (world) community; when the Earth's rich resources are used for people, not profit; when all citizens of the world are seen to have equal, intrinsic worth regardless of background, intelligence or class; when our collective aims are truly altruistic rather than accumulative then there would be no worries about taking money to the grave. Wealth would be real, not virtual; the Earth's resources would belong to all, not to be pillaged for profit for the minority; talent, skills and human endeavour would be the wealth to be spent by all for the benefit of all. How satisfying to go to the grave fully used up with absolutely nothing going to waste. The left has been sniggering at us of late. Yes, we in the SPGB have our warts – which organisation has not? Yes, we have our problems, but we have mechanisms to solve them democratically. And from what I know of my 16 years of Party membership the current problem will pass and the Party will emerge stronger. For over a century the SPGB has campaigned tirelessly for the establishment of system of society based upon the common ownership and democratic control of the means for producing and distributing wealth – this despite the many internal disputes the Party has weathered. In those 103 years we have not compromised our position once on any issue. We remain the sole true revolutionary organisation in Britain. The WSM remains the sole revolutionary organisation in the world. Our problems aside, how have we really faired politically? Just what have we achieved? What can we brag about? Well, socialism certainly seems no nearer than it was 103 years ago, though it must be said that the technology needed to establish a world of abundance is by far in advance of that familiar to our founders. Moreover, the working class nowadays are far better educated than the workers the autodidacts of the SPGB 1904 tried to win over to the socialist cause, yet still we admittedly find it difficult to recruit new members. Our membership remains small, scattered and, let’s be honest, relatively inactive, and whilst we have had some decent election results in recent years we are yet to win a seat in any local or national election. And it is not uncommon for members to despair at the poor results of their efforts and to resign. Of course we have faced many obstacles to our growth which we could not foresee back in 1904; not least of which was the 1917 Bolshevik coup and the myriad groupings that sprung from the inspiration of the “Russian Revolution” and which, in truth, have caused untold damaged to the true socialist cause. For many years now, we in the Socialist Party have spent a great deal of time not only trying to rescue the socialist name from the many Leninist and Trotskyist groups who have sullied the image of socialism, but also in exposing the fallacy that socialism was ever established in the former Soviet Union and distancing ourselves from the illusion held by many that socialists advocate violent revolution and that socialism can exist in one country. Though we were in existence a long time before any left wing group in Britain, we find that we have constantly had to compete, for the minds of the workers, with groups like the SWP, RCP, CP, CWO, CPGB and a hundred others, all of whom pedal the politics of confusion, offering the workers fast-track routes to the Promised Land, prepared to recruit anyone capable of signing their membership forms, regardless. Little wonder we have had such a difficult time recruiting. Moreover, we have watched in dismay the ongoing workers’ support for the Labour Party in Britain - workers’ belief in Labour’s claim to be “socialist”, workers’ belief in the empty promises of New Labour and that party’s continued determination to betray those same workers at every opportunity and lead them down the blind alley of reformism. It’s fair, also, to mention the impact of the thousands of single-issue groups on the political scene and indeed the collective consciousness of the workers. Groups like Friends of the Earth, Greenpeace and CND, though well meaning, focus many a worker’s mind on a single issue or reform, as if this is the most pressing matter of the day. If their combined energy had have been spent on attacking capitalism as a system, instead of campaigning against problems the system throws up, distracting millions of workers, then our task would have been halved. So in honesty a great amount of our work has been taken up in attempts to rectify the damage done by other political organisations to socialist ideas and in challenging the single-issue mentality of thousands of organisations. Make no mistake about it – we have tried. Let’s not forget that back in 1904 there was no means of mass communication, bar newspapers. Advances in communication technology were undreamed of in 1904. Now many workers have several televisions in their homes, and access to hundreds of channels. They have computers and access to a world wide web of information and all manner of electronic gadgetry that helps lull them into political apathy. And controlling all of this is the big corporations and the advertising industry, turning those same means of communication largely into idiot boxes that numb the minds of the workers. Since 1904 there have been vast improvements in health, housing and in the way people live generally and which gives workers the impression that capitalism works for them and that the politicians ‘running the show’ have their best interests at heart. Little do the workers realise that any reforms were really the price the master class had to pay for their continued survival, and were certainly not an act of altruism. And all improvements in living were in general relative. Moreover, it was the workers who produced this wealth the politicians have taken the credit for and which the workers have erringly thanked them for on election day. Of course we have had our successes over the years. 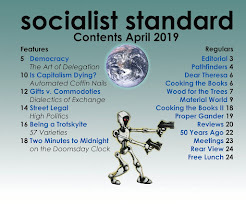 Our monthly journal, The Socialist Standard, has been printed without fail since September 1904, producing sound Marxist analysis of current and international events as they have happened. We now have companion parties and members right across the world and hundreds of thousands access our website. We have our own head office, owned by the party and we produce literature and leaflets on a wide variety of subjects. We hold day schools and summer schools and attend as many events as we can to put forward our arguments to the workers. We contest elections every year — with increased returns in some places — and we regularly have members appearing on TV and radio and in the press arguing our case. We have for 103 years held lectures and debated with scores of political organisations and notable personalities. Many of the latter now exists on audio cassette andc CD and more recently we have produced a popular and much viewed film (Capitalism and other Kids’ Stuff) to highlight our case. In recent years we have been active at almost every major event in Britain—from Glastonbury to Gleneagles—handing out leaflets, putting up speakers and erecting literature stalls; in short, doing our level best with our limited resources to propagate the case for a non violent, democratic transition to socialism. In recent weeks we have had stalls at Tolpuddle and the Durham Miners Gala. So let’s be fair – the lack of socialist consciousness and desire for real change is hardly down to us. It is the lack of success of the class of wage and salary workers in general. It's up to them, not us, to establish socialism. But such have been the distractions – some listed above – that we really have had our work cut out for us. We can also consider ourselves successful in having developed some quite original and distinctive arguments in response to advances within capitalism. We were, for example, perhaps the first political party in the world to contend that the Russian dictatorship, in the wake of the 1917 coup, was “state capitalist” rather than socialist — an argument since adopted by many others. On other occasions, The Socialist Party has developed new distinctive arguments in that we have effectively blended extant strands of political and economic thought into a entirely new mix. This is most notably the case with our views on the “reform or revolution” question, where two seemingly incompatible theories were entwined into a unique new political position. There are indeed a number of distinctive arguments The Socialist Party has developed since our formation in 1904 and while socialism has not yet been achieved, we have helped make some serious contributions to the development of socialist political and economic theory – weapons for battles now being fought and yet to come. Here are some of our most noteworthy contributions. The Socialist Party resolved that modern wars are fought over issues of concern to the owning class and not the workers; specifically being disputes over areas of influence, trade routes, sources of raw materials and sometimes overseas markets or the strategic points from which all of the same can be defended. When war broke out in 1914, The Socialist Party was the only political organisation in Britain to unequivocally oppose the conflict. Many of our members were imprisoned for refusing to join the army. Other parties professing to uphold the interests of the working class took sides, having identified anti-militarism, “national liberation” and other causes as goals worth pursuing before socialism. Admittedly, in the 19th century, socialists like Marx and Engels supported so-called “progressive wars” against feudal reaction at a time when capitalism had not yet become the dominant world system. They thought that sweeping away feudal regimes like Tsarist Russia would help pave the way for socialist organisation and eventually revolution. Their position in the period of capitalist ascendancy over feudalism was taken by some supporters of war in 1914 as justification for their own action. The Socialist Party maintained that whatever Marx and Engels’ views in the 19th Century, there could be no question of socialists taking sides with any section of the capitalist class once capitalism had become the dominant world system and socialism the pressing alternative to it. When capitalism has advanced far enough to create the material conditions for socialism, the capitalist class becomes socially useless and all nation states reactionary, needing to be swept aside not bolstered. The Socialist Party, unlike most of the “left wing”, opposed the establishment of the dictatorship in Russia under the guise of “workers control” or “socialism.” The Socialist Party argued that Russia, under Bolshevik rule, would be forced to take the capitalist road as the only one open to it. Socialism in one country (an economically backward one at that) and without majority support was impossible. The Bolshevik “Revolution” was in fact a political coup d’etat by a self-appointed elite of political conspirators with no respect for the wishes of the majority. For decades, The Socialist Party has maintained in distinction to Bolshevism that minority action can never lead to socialism. Socialists have affirmed that Soviet Russia was capitalist and could only have been so given the nature of its political birth. It exhibited all the principal features of the capitalist mode of production in one form or another, notably wage labour, capital accumulation, commodity production, class division and the exploitation of one class by another. In the 1920s and 30s, the Communist Party and Independent Labour Party (ILP) argued that capitalism was going to collapse, with socialism arising, phoenix-like, from the ashes. The Socialist Party contended that this was baloney and that capitalism would not pave the way for socialism without majority political action. This contention was repeated in the years after the Second World War to Trotskyists and left-communists who took up afresh the mantle of “capitalist collapse”. In particular, The Socialist Party denied the claim that capitalism would collapse because of an in-built lack of purchasing power, with the workers and capitalists combined unable to buy back the entire product of industry. This claim was based on a erroneous view of the relationship between productive labour and effective demand in capitalism – that somehow there is a permanent mismatch between the value of the mass of commodities produced at any one time and the income derived from this production in the form of surplus value (unpaid labour) and the value of workers’ labour power (unpaid labour). This “deficiency of purchasing power” claim—sometimes called “under-consumptionism” and wrongly credited to Marx—is a myth and has been disproved both in theory and by history. The Socialist Party has argued that enough purchasing power exists in capitalism—it is how it is used that causes difficulties, as its relationship to production is not planned. This is the phenomenon which gives rise to periodic (not permanent) crises and slumps and the trade cycle which has been a characteristic of capitalism since its infancy. In response to the Spanish Civil War and the Second World War, The Socialist Party resolved that bourgeois democracy, with elementary political rights, is the most favourable condition for the overthrow of capitalism. In addition, we maintained that workers living under dictatorships should struggle to establish basic political rights, though without ever giving support to capitalist organisations, including those professing bourgeois democracy as their aim. This is not only because of the general reformist and anti-socialist nature of such organisations, but because these organisations in government are compelled to use the might of the state machine against the working class in the interests of capital. For similar reasons, The Socialist Party resolved that socialists cannot support allegedly “democratic” countries fighting wars against dictatorships. Socialists are aware that wars are never fought over such lofty ideals and that history has proved that “democratic” states will prop up and assist dictatorships if it is in their interests to do so. The Socialist Party position was vindicated after the second World War when the allies carved up Europe in such a way as to hand half of it to the Stalinist dictatorship while leaving Franco’s Spain and Salazar’s Portugal, among others, as neo-fascist regimes. In the late 1940s, we argued that the setting up of the “welfare state” in Britain and other countries after the war would not solve the problems of the working class, which are integral to capitalism. To the extent that the welfare state represented a gain for some workers on the previous arrangements, we noted that it was always dependent on the maintenance of a low level of unemployment and destitution—a situation capitalism is incapable of sustaining for long. In recent decades unemployment, the rise of the so-called “underclass” and demographic change have undermined welfare provision as it came to be built up. Over time the burdens on the welfare state have increased just as the capitalist class finds it increasingly difficult to finance it through taxation of profits. These increased burdens have led to a squeeze on the rate of profit after tax—the bottom line for the capitalists—which is the main factor determining the pace of future investment and growth, and also whether firms or entire nation states sink or swim in the competitive world economy. In distinction to the main political parties, The Socialist Party was never taken in by claims of Keynesian economics, which promised low unemployment, steady growth and stable prices for the post-war period on the basis of government borrowing, “easy money” and redistributive taxation, especially when slump threatened. Unlike most of capitalism’s economists, socialists argued that Keynesian policies could not prevent unemployment and crises as the major determinants of these—production for profit, the anarchy of production and capitalism’s antagonistic system of income distribution, are integral features of the market economy. Sure enough, everywhere Keynesianism was attempted it proved disastrous and eventually provoked the return to “laissez-faire” economics in the 1980s. Its lasting legacy—still with most of the capitalist world—has been persistently rising prices. This has been brought about by the mistaken belief—exposed by The Socialist Party from the standpoint of Marxian economics—that an excess issue of inconvertible paper currency would act as a stimulus to production and trade. In Anti-Duhring, Friedrich Engels had written of production in socialism being guided “on the basis of one single vast plan”, but given the complexity of modern society, this is not possible. The Socialist Party realised that socialism could not be built on the basis of a centralised allocative plan which would be, by definition, antithetical to local decision-making, and which would be unresponsive to changing needs. Instead, The Socialist Party suggested that socialism would operate a system of production solely for use, operating in direct response to needs, these needs arising in local communities. The operational basis for this system would be calculation in kind (e.g. tones, kilos, litres etc.) instead of monetary calculation, combined with the responsive system of stock-control outlined in our pamphlet Socialism as Practical Alternative. Such a system would be able to allocate resources much more efficiently, responsively and democratically than a pre-determined allocative plan which had proved next to useless for state capitalist regimes, and is no model for a real socialist democracy. If anything, the aforementioned contributions to political and economic theory should reveal that The Socialist Party is no unsuccessful, sterile organisation full of utopian dogmatists. Socialists are not content to sit on the sidelines of history – we are original thinkers and are open to innovation and new ideas – providing, that is, that they are sound. We are willing and able to cooperate with men and women the world over to bring about a better society, and we are proud of the small contribution we have already made to the movement that will one day sweep away capitalism once and for all. We remain small in size for numerous reasons outside of our control, not least because we refuse to compromise our position and pursue reforms and single issues that the myriad reform groups like the SWP do to the detriment of revolutionary struggle. Our message to those who can see no future so long as the market economy remains is join us – and help us make history. Let’s make sure that this coming century sees the end of the profit system. This is not to say, however, that all members in 1936 were in agreement. Indeed, a small number left .Similarly, the Falklands War was the source of some disagreement (the August 1982 Socialist Standard has a letter from one member expressing doubt as to whether the Socialist Party's position that wars are the result of capitalist rivalries for markets, trade routes, etc. applied to this particular conflict). But our position remains valid. Below is part of an article which analyses the Spanish civil war from a Socialist perspective. "The Civil War, which cost 600,000 lives, ended with a Franco victory in March 1939, and the fascist dictatorship lasted until his death in 1975. In Britain, the civil war was largely presented in ideological terms of "democracy versus dictatorship", and "atheism versus religion", with supporters of both sides levelling charges of atrocities, but the reality was very different inside Spain. Franco was backed by the Catholic hierarchy and the big landowners but many of the poorer priests supported the Republican government, as did most of the air force and part of the army and navy. It was estimated in 1931 that more than half the land was owned by less than one per cent of the population, the Catholic Church being the biggest landowner. It was not the Spanish capitalists who backed Franco. Avowedly capitalist political parties belonged to the Popular Front and although in 1936 the Spanish "Socialist" Party were the largest party in parliament, they were not represented in the government until six months after the war started. The whole question was overshadowed by the rivalries of other powers, of Germany seeking a base in Spain which would give them control of the Mediterranean and Britain, France and Russia wanting to prevent it. Germany and Italy gave massive support to Franco, as did Russia to the Republicans. The German condition for giving support was an agreement giving them control of the rich Spanish iron ore deposits. The Russian government insisted on being paid for the aid it provided. In Britain most Labour and Liberal sympathy was with the Republicans. The Tory government maintained a policy of "non-intervention" but an influential section of the Tory Party favoured helping the Spanish government against the Franco rebellion. Thousand of volunteers from outside Spain fought for the Republicans and others for Franco. It was clear from the outset that the issue in the civil war would be largely determined by the amount and type of aid coming from Germany, Italy, France and Russia. As the war took its course, first one side and then the other gained the advantage. It was the view of Hugh Thomas in The Spanish Civil War that "Germany committed enough war material to tip the balance finally towards the Nationalists". According to the Penguin Dictionary of Modern History (p. 306) what led to the final collapse of the Republican armies was a change of Russian policy "which cut off aid from that source". As a Republican writer complained, within six months of the Russian government backing the Spanish Republicans against German arms and troops, Stalin and Hitler were "hobnobbing" under the Stalin-Hitler pact of September 1939. The aid-giving powers, Germany, Italy and the Popular Front government in France were all using the war to test out their new weaponry. The League of Nations was quite impotent to prevent the civil war or the intervention by the other powers. Its successor, the United Nations, condemned the Franco dictatorship and resolved that member nations of the UN should withdraw their ambassadors. This was largely ignored and it did not prevent the British government allowing a Spanish ambassador in Britain and a British ambassador to be based in Franco Spain. The United States government in 1953 concluded an agreement with the Franco government to give military and economic aid in return for the lease of air and naval bases in Spain. It was the turn of American capitalism to see a vital interest in controlling the Mediterranean, against Russia. "The Communists were the only party to realise how important it was to secure the Unity of the Working Class. That is why the Communist Party strove so stubbornly for the creation of a united trade union centre. But the "Socialist" and Anarchist leaders persistently worked to defeat this end. For they knew that the effect of such a unity would be to strengthen the influence of the Communists in the trade unions and would lead to victory over the forces of reaction. The Communists redoubled their efforts to create a single party of the working class based on the the principles of Marxism-Leninism. But the "Socialist" leaders steadily opposed the formation of such a party, which would have ensured the hegemony of the proletariat in the People's Front and the government." "What unity did the Communist Party respect or attempt to establish? - none whatsoever" and finally, "Neither in war nor revolution has anti-fascist Spain had a worse enemy than Stalinism". The simple truth was that at the time there never existed the basis for unity on the Republican side. Socialist Party of Great Britain member, Brian Gardner, reflects on the SPGB's 2007 Summer School that took place this past weekend in Birmingham. This weekend some 40-plus members, sympathisers and Standard-subscribers from as far afield as Italy, Turkey and USA gathered for a weekend of discussion and debate at the annual summer school organised by Birmingham Branch. Under the theme “Thinkers of the 20th Century” a range of ideas – from disciplines as diverse as anthropology, information technology, literature and philosophy - were reviewed from a socialist perspective and much heated debate followed. It's not surprising that a recurring issue throughout such a themed weekend is that of “freedom”. Much abused in everyday currency, “freedom” often translates as little more than lower taxes and fewer regulations, issues of little or no concern to world socialists. In contrast, socialists are intensely interested in freedom, whether its the freedom we have to surpass the gene as a constraint on how we live, the freedom to work co-operatively in software development/use software without restrictions, or the more abstract freedom of the individual under the state. The dystopian visions of Aldous Huxley (Brave New World) and George Orwell (1984) then, formed a large part of the discussions around the first two talks from Richard Headicar and Mike Foster respectively. What sort of state do we live in now? Which dismal projection has survived the best? Probably a bit of both is the answer: Orwell's boot stamping on the face is still prevalent in many parts of the world as the market system emerges to an ungrateful population of new wage-earners. “Late” capitalist states on the other hand have clearly evolved more complex and subtle forms of oppression, including of course the diversions of Big Brother (the TV “reality” show) and the dubious freedom of consumer choice. To what extent can you separate the thinker from the thoughts? While Orwell got his hands dirty down mines, in hotel kitchens and most famously on the frontline in Spain, Aldous Huxley in common with most of the other thinkers risked little more than a paper cut in the drawing rooms of Bloomsbury. Does this influence how we read each author? As Marx famously noted, “the philosophers have only interpreted the world the point is to change it”. Someone who has done very little interpretation of the world, but by contrast has undeniably changed it is Richard Stallman. A software engineer turned intellectual property activist, Stallman developed GNU software, CopyLeft and the free software movement. This has inverted contract law to ensure that CopyLeft software (such as Linux operating system) gets the fullest expression of its use value (ie it is free to copy and use), but has effectively no exchange value as users have to agree to make available and not restrict access to any amendments made to it. 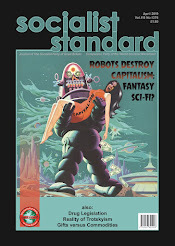 Tristan Miller discussed how this little oasis of “socialistic” production has grown unstoppably within the body of capitalism and effectively mirrors – albeit within the software and digital music communities – all the features of “from each according to ability, to each according to need”. The subject of freedom of the individual phenotype (eg human) as opposed to the dubious constraints of biological determinism arose during Adam Buick's introduction to the cultural anthropologist Ashley Montagu, who is best known for his contributions during the middle part of last century to the nature v nurture debate. It is likely that his writings will stand the test of time better than the more recent fashions of biological determinism - sociobiology and evolutionary psychology - as typified by the “popular" science writers Richard Dawkins, E O Wilson and Steven Pinker. If human nature is slowly becoming less of an ideological “barrier to socialism” than it once was, it will be due to the painstaking work of real scientists such as Montagu. Simon Wigley got the short straw in having to present the ideas of the Frankfurt School of philosophy shortly after a large Saturday lunch. He stuck to the brief given to him admirably however, particularly given that he had little enthusiasm for these ideas, as he made clear. Whilst some in the audience wanted to shoot the piano player, others were grateful that Simon had done the hard work of reading this stuff and translating it from the English for our benefit. Personally speaking I gained most from this talk – even if it was only to gain confidence that the Frankfurt emperors were indeed just as stark naked as I had always suspected, and that rather than being extensions to marxist philosophy, the ideas of Adorno, Habermas et al (along with the post-modern ideas they set the scene for) are negations of class-based analysis, of the enlightenment, and even of the scientific method that drove it. The material conditions of capitalism really haven't changed that much in the last century – and our philosophies really dont look like they need to change much either. Anyone who thinks that world socialists are intellectuals, academics or armchair philosophers would have been pleasantly surprised at the disdain with which these ideas – far removed from anything actually to do with working class experience – were discussed. Habermas could have dug coal during the Spanish Civil War for all I know, but – judged on their own merit - his ideas still should not be taken seriously. In summary, there is of course a perpetual tension between theory and practice that no political organisation, whether liberal, marxist or anarchist, gets right all the time. However, assisted by a plentiful supply (according to need of course) of the local Black Country beer, and the opportunity to catch up with old comrades and new sympathisers, most attendees I spoke with left the weekend feeling stimulated, reinvigorated and better-prepared for the more practical need to spread the socialist case. Surely, the ideal balance between ideas and action. Twenty-two years ago today Bob Geldof asked "..why do people starve on one side of the world while on the other people are paid not to produce food, or "surpluses" are allowed to rot? He said that no-one had yet answered that question for him satisfactorily.."
Well, in an article titled 'Politics of Live Aid (Socialist Standard, September 1985) we let him know that "famine is not a temporary upset in an otherwise harmonious world order which can be put right by a quick injection of money and sacks of grain: it is an endemic feature of a world system of society which dictates that those who have money to buy food can eat, and those who have no money must starve; that unsold food produced in one part of the world will not, in general, be transported to where it is needed because no profit would be made. For in our society food is not produced because people need it, but because those who own the farms and land can make a profit from it. And if it cannot be sold profitably then it is left to rot." Fast forward twenty years and things must be better, after all Bob received a gong and the first Live Aid was thought to be a great success? Not at all: "Over the years, agencies of the United Nations such as the Food and Agricultural Organisation have posted the numbers suffering poverty. For example, in 1975, 435 million people were seriously undernourished. By the year 2000 this had doubled to 820 million. UNICEF states that approximately 40,000 children under five die each day from preventable causes. These figures indicate that since the first Live Aid concert in 1985 the numbers dying from poverty have been increasing horrendously, which leaves little doubt that pop concerts and the charities have made no significant impact on the problem. The grim facts are that the present methods of the "Make Poverty History" campaign stand no more chance of ending deaths from hunger. If we are to be serious stopping this perpetual holocaust, the many thousands of people who support this campaign should have a serious re-think about how best to go about it.."
Clearly Sir Geldof has not done so. We even sent him a letter , apparently to no avail. We cannot expect help from him to bury this murderous system. But capitalism's gravediggers can be found in the most unlikely places. The Economist (July 7th-13th) for example, provides some food for thought, although, to be sure, the short piece titled 'Why poverty isn't history' comes a poor second behind 'The trouble with private equity': "...The 1980s were supposed to bring water and sanitation to the great unwashed; the 1990s were supposed to provide “education for all”.." Referring to the UN's latest drive against poverty as "half crusade and half charade", the article concludes, unsurprisingly, with the statement that countries should inch "..their way out of poverty by their own efforts.." Ho hum. But it is the final sentence which Socialists would endorse: "To make poverty history, you have to understand how history is made." “The law, in its majestic equality, forbids the rich as well as the poor to sleep under bridges, to beg in the streets, and to steal bread”. A homeless man who argued that begging is a form of free speech - after he was arrested for asking a policeman for a dollar in a New York suburb - has won his case. We trust then that this magnaminous, if overdue, change of heart in capitalist legislation is not restricted to the homeless and that the rich also may presumably be homeless and beg in the streets for a dollar. Socialism is - on the face of it at least - attractive to many: the apparent principles of “fairness”, or looking after everyone in the community (rather just number one) have broad appeal of course. But that is often insufficient to outweigh what many consider to be the main downsides to socialism. Prime amongst the perceived disadvantages of a socialist society is the idea that socialism is an inefficient way to produce wealth. In contrast, the market system portrays itself as a dynamic, productive and creative mechanism. By incentivising the inventors, the entrepreneurs and the risk-takers (so the fairy-tale goes) capitalism liberates human beings to work harder and smarter, producing more wealth and more choice. The only problem with this superficially-appealing narrative is that capitalism is not in fact geared to the production of wealth per se, but rather is tailored to the production of profit, a very different thing. What is the evidence for this, and why is it an important distinction? Yesterday in the UK, the new Prime Minister Gordon Brown unveiled plans to try and encourage the house-building sector to... (wait for it)... build more houses. Now you may think that housebuilders would need little encouragement to build houses. That after all is what they do - that's what it says on the label. But apparently not. The UK homebuilding sector is already under investigation from the Office of Fair Trading because – bafflingly - they seem unable (or unwilling) to build sufficient homes. Perhaps there is an innocent explanation for this. Are there maybe far too many houses in the UK for the number of people? Is it the case that the population of the UK all live in comfortable, spacious, well-heated and refurbished houses? Is there no demand for new housing? Needless to say this is not the case. Millions of houses are sub-standard in terms of structural safety, condition, dampness, insulation ratings, degree of weather tightness (REF). Some 2,000 people sleep rough each night in the UK and in Scotland alone there are 30,000 homeless “households” with 3,000 children and pregnant mothers housed in B&B temporary accommodation. House repossessions in the UK are rocketing, currently approaching 400 per day. So what's happened? Why has the market failed? Why has the magical driving force of demand not triggered increased supply in this sector? The reason is that inside a market-based system of buying & selling, wealth is not produced to meet human needs of the entire population, but instead to meet the profit expectations of the minority who monopolise ownership and control of the means of producing wealth (in this case, the housebuilding employers). For many years now it has been in their interest to keep the brake on the rate of releases of houses to the market, as this helps keep the price up: better to make 30% profit selling one house at £200,000, than make 20% profit on two houses at £150,000. And of course every plot of land they build on is one less house they have to sell in the future, and the housebuilders don't see the price falling in the future. In the ideal theoretical market – beloved of the apologists of capitalism – this shouldn't happen. But in the real world, the housebuilders are far from being independent economic agents, and can be more co-operative than competitive. This isn't a one-off, peculiar to the housing market. In fact there isn't a single market that is unaffected by this phenomenon. Despite the government bluster, there is little they can do to "correct" the market. Capitalism liberates nothing. The market system itself creates nothing beyond profit and misery, and will routinely stifle or sacrifice productivity for profitability. The ideological claims for capitalism as being an efficient system just don't stand up to any sort of examination, with endemic inefficiency and wastage inherent. And attempts of governments to “correct” or regulate the market are usually cosmetic, partial and powerless in the face of the iron law of profitability. To return to the item at the start of this piece, the good news is that at least it would appear that the homeless are indeed now permitted (under Human Rights legislation) to beg. However the man in question (Eric Hoffstead, 36) didn't have much opportunity to celebrate his legal victory – apparently he was imprisoned for a separate trespassing charge. Maybe we now need to try and make trespassing a “human right”? It’s a familiar sight on the TV news in Japan. Four somber looking men are seated at a flimsy foldout table in the front of a non-descript conference room bathed in fluorescent light. The culprits—for these men look guilty of something—issue a statement and answer questions. And at some point they all stand up. The ringleader offers an apology in the most formal and sincere-sounding language he can muster (without admitting direct responsibility). He finishes, which is the cue for the others to join him in a deep, 45-degree bow. The camera shutters click and flashes ricochet off the men’s scalps as they stoically hold that bow, for several seconds. And then, with impeccable timing, the heads lift up again, simultaneously, leaving the viewer to wonder if they had practiced before the press conference. Yes, it’s the latest corporate scandal. The “bad apple” this week, falling from a capitalist tree that produces some very strange fruit, is a meat-processing company with the wonderful, made-in-Japan English name: Meat Hope, Co. Its meat-headed president, Minoru Tanaka, could hardly have known how apt that name would prove to be. It turns out that customers who had purchased products from the company over the years did not exactly receive the meat they had hoped for. Customers who purchased “100% ground beef” ended up with cheaper ground pork mixed in. If that were the extent of Meat Hope’s crimes, it would be no big deal as far as corporate scandals go in Japan or elsewhere. But the cost cutting of Tanaka—who ironically looks and acts like a cross between a bull and a hog himself—did not stop there. He mislabeled imported meat as domestic meat, altered expiration dates on products, improved the color of the mislabeled ground beef by adding cattle hearts, etc., etc. And his company has been cheating the public in this way for over two decades. The first reaction of Tanaka, before the ritual bowing, was clear anger at the misfortune of being caught. He even lashed out at consumers for wanting cheaper and cheaper products. In a way, the poor guy has a point. His company was only acting as market competition dictates. Cut costs so you can undersell your rivals and still pocket a respectable profit. It is safe to say that there are dozens of other meat-processing companies out there, guilty of the same crimes, desperate to avoid the fate of Meat Hope. Tanaka just happened to be the unlucky cockroach on the kitchen table when the light was switched on. These corporate scandals have revealed some very unsavory characters at the “top” of society. The company presidents, who almost always have a photo of themselves shaking hands with the latest Prime Minister, find it hard to conceal their own arrogance, as it reflects a lifetime of barking orders at their lackeys. In a scandal last year in the construction industry, for example, the president of a company named Huser (which stands for “Human User”! ), Susumu Ojima, came out swinging at first, admitting nothing. He came across as a violent thug who was still in shock at being caught. So the public must find it gratifying to see these assholes humbled, even if it is just an act, and forced to apologize. President Ojima, for his part, suddenly underwent a total makeover, presenting himself as a nice guy, with a new haircut, glasses, and Buddhist prayer beads. It is certainly fun to savor the misery of these miserable people, but at the same time the scandals almost invariably expose corruption in every corner of the industry involved. In that construction scandal last year, everyone—from the architect and builders to the sales agent and building inspectors—were in on the scam of constructing flimsy apartment buildings and hotels. The initial scandal opened the lid ever so slightly on that industry and the public was sickened by the stench that seeped out. How much more proof do they need that the capitalist system of production for profit leads to no good? How many more times do I have to watch these wretched men bowing on my television screen? Check out the World Socialism (Japan) page on MySpace. Premier Gordon Brown said the Union Flag should be flown proudly from every public building in Britain. The move would be a signal of defiance to terrorists like those that attacked Glasgow airport last Saturday". Then in an interview on ITN on Thursday he revealed that he had given orders that the Union Rag should fly permanently over his new residence at Nº 10 Downing Street. So, not content with trying to outflank the Tories by presenting Labour as the natural "party of business" he now wants to outflank them by showing that Labour is more jingoistic than them. Soon, the Trotskyists will be debating whether to vote Tory as the lesser evil! As far as socialists are concerned all flags, as the emblems of the capitalist states into which the world is now artificially divided, are rags on the end of an idiot stick. We reject them all. We are internationalists, or rather one-worlders, who stand for a united world with no borders where the Earth's resources will have become the common heritage of all humanity. One place where you'll never see the Union Rag flying will be 52 Clapham High Street, in London. Smile, Smile, Smile! But Why? The philosophy of the compulsory smile goes back at least to 1936, when Dale Carnegie’s classic How to Win Friends and Influence People appeared. His first two pieces of advice are “don’t criticize, condemn or complain” and “give honest and sincere appreciation.” How you can always be honest and sincere if you have to be appreciative, whatever your true feelings may be? Don’t ask me! They smile when they are low. That your favorite uncle died at dawn. You're broken-hearted, but you go on. From this I infer that you might be let off smiling duty if a parent rather than just an uncle has died. You might get a few days’ “family leave.” But when you return your smile must be firmly back in place. Besides show business, smiling is a condition of employment in all service jobs involving contact with the public (and to a lesser extent in many other jobs). A waitress, air stewardess, hotel receptionist or croupier, for example, is expected to keep smiling, however rude and unpleasant a customer may be to her. So why do we have to smile? Just do your best to smile, smile, smile! We are also told: “Smile and the world smiles with you.” In other words, look unhappy and the world will give you the cold shoulder. I suppose it’s true to some extent: I have enough troubles of my own, thank you, don’t burden me with yours! But what does that say about our way of life? One curious rationale for smiling is the “urban legend” that more facial muscles are used in frowning than in smiling (exact figures vary). Smiling saves effort. According to Dr. David H. Song, the claim is false: a smile uses 12 muscles, a frown only 11. In any case, isn’t exercising as many different muscles as possible supposed to be good for us? In figuring out the likely origin of the insistent demand to smile, smile, smile, it helps to consider whose interests it serves. Above all, I think, the interests of those who do not have much to complain about themselves but who are natural targets of others’ complaints. That means: the most privileged and powerful section of society. If you take Dale Carnegie’s advice and “don’t criticize, condemn or complain” about anyone or anything, then you will never develop a critique of the social system or an aspiration to change it. Ultimately, I suspect, that is the smile propaganda is about. Without Comment . . .
“But what emerged far more strikingly was his determination not to pander to leftwing Labour prejudices against big business and the City. On private equity, Mr Darling declared that any decisions to alter the tax structure needed to be carefully considered, despite the growing pressure for change. “I think there’s a number of things that need to be done, but I’m very clear that if you make changes to the tax system you need to think them through,” he said. He was equally cautious over another clamour – the demand from many in the Labour party for a crackdown on the non-domicile tax status of wealthy business figures resident in the UK. “I am well aware of the fact that there are a number of people who do business here, and who are contributing to business here who can go somewhere else,” he said. “Labour is set to undergo a "serious redesign" as part of a drive to replace the Conservatives as "the natural party of business", John Hutton has said. The business, enterprise and regulatory reform secretary pledged to be "aggressively pro-business" in his new brief. The Department for Business, Enterprise and Regulatory Reform replaced the Department of Trade and Industry as part of a Whitehall shake-up following the appointment of Gordon Brown as prime minister. Hutton told the FT that David Cameron's "harebrained" policies presented "a major opportunity for Labour". Pointing in particular to the Tories' carbohydrates trading scheme, Hutton argued that Cameron had made "some major mistakes in their rebranding exercise in downplaying the importance of business". And he insisted the new government structures - including the creation of a Business Council - were more than "rebranding". "It's a serious attempt to redesign across government how we work with business," he said. He added: "In the whole debate about more employment regulation, you have to be mindful of the costs to British business," he said. "You've got to be very careful and always take into account the impact and burden on business." “Mr Brown did something I have long suspected he might do, but never fully believed: he started to outflank David Cameron from the Right and to reposition Labour as Britain’s most solidly pro-business party. Mr Brown’s reasons for trying to do this are quite simple: he has always believed that the steady growth of the British economy in the past ten years has been his greatest achievement as Chancellor. Maintaining this growth is now the indispensable condition for his success as Prime Minister, and justified the sacrifice of impractical socialist precepts he once believed. Outflanking Mr Cameron on economic policy would also be politically attractive, because it would cut the Tories off from their natural electoral heartland. But while the logic of a shift towards pro-business policies under Mr Brown was always quite compelling, almost nobody believed it would happen, and even I had my doubts. Partly this was a matter of style. Mr Brown has always been very unpopular in the City of London and the business community and his elevation to Prime Minister has been a big source of worry to British businessmen and financiers. Even though they could never quite put their finger on what they were worried about, the visceral distrust of Mr Brown was impossible to disregard. In the past few days, however, this attitude has been noticeably changing. The flanking operation began with Mr Brown’s decision to appoint Sir Digby Jones, the outspoken former Director-General of the CBI, as a minister without forcing him to join the Labour Party, and invite Damon Ruffini, Britain’s most prominent private equity boss, to join the new Business Council. The pincer movement continued on Tuesday when John Hutton, the new Secretary of State for Business, accused Tories of “downplaying the importance of business” and added that Labour “wants to be the natural party of business”. But these were just preludes to the real thrust of the new strategy, revealed by Alistair Darling in yesterday’s Financial Times. In this interview, the new Chancellor ruled out any rush to impose new taxes or regulations on private equity and hedge funds, as demanded by a strange alliance between the trade union movement and populist tabloids. More generally, Mr Darling repeatedly emphasised the importance of the City and of liberal financial markets as “absolutely critical” to the prosperity of the whole British economy, adding for good measure that Britain’s increasing specialisation in finance was something to be welcomed, not opposed. Tony Blair finished PMQs this Wednesday with: "That's it, the end." As soon as he said that people were talking of "Brownism." "Blairism", "Thatcherism", etc are labels which hide an essential truth: Prime Ministers do not change the basic nature of the capitalist system, nor could they if they wished to, which quite frankly they don't. "-ism" is being tossed about very freely. Once upon a time you could talk of liberalism, conservatism, fascism, nazism, socialism, communism, marxism and capitalism. Now there are a zillion other "isms". Somebody takes political office, make a new "ism"! I am not suggesting something so daft as Gordon Brown being the same as Tony Blair. He'll have things he wants to be passed through the usual parliamentary procedures which are different to Blair, some of it probably welcome to the working class. Brown won't differ from Blair or any other PM, though, because his job description is to run British Capitalism PLC. Inevitably, the fundamental contradiction in society, class war, will emerge. The capitalists fleece the workers for profit, rent and interest. Us? We sell our abilities for a wage or salary or else need to beg for welfare. They own, we don't. Brown will be on the owners' side. The end Blair spoke of was his leadership of the Labour Party and his time at Downing Street. It isn't the end of an era. Capitalism (that's its name, not Brownism or whatever) is still here. Book Review from the July 2007 Socialist Standard. Singer and songwriter Billy Bragg has produced an engaging and enjoyable read, in an attempt to search for a meaning to his working class upbringing and his relationship to the place he was born, Barking in Essex. This is a romp through political and economic history as well as a look at popular music and culture as Bragg experienced it growing up in the 60s and 70s. The chapters that work best are those where Bragg examines his family origins in East London, analysing key historical events from a family perspective and using the historical artefacts they left behind to do it, from pictures of dockland trade union struggles to wartime diaries and gas masks. As might be expected, the chapters focusing on Bragg’s formative musical influences are good too, and he has an ability to set them in a social and political setting in a way that links his personal development to wider developments: most notably the vestiges of the hippy era, punk rock and ‘Rock Against Racism’. His ultimate aim though is to ‘reclaim the flag’, finding a meaning and purpose in Englishness that transcends and even nullifies the Little Englander nationalism of the Euro-sceptics and the outright racism of the BNP. This is a more difficult task and one that is inherently problematic. For while having pride in tangible places that have meaning to those who live there (in Bragg’s case, Barking) is one thing, having patriotic pride in entirely artificial constructs such as nations is another thing altogether. In effect Bragg tries to create a left-wing English nationalism that rivals the leftism of the nationalist parties in Wales and Scotland, as if Welsh and Scottish nationalism had somehow been a force for radical politics (rather than another nationalist dead-end) that England can emulate in some way. He writes intelligently about England and the Empire, and the methods through which it came about, yet can still find time to bemoan the fact that England was the only country in the last World Cup without its own parliament, passport and national anthem. If Bragg’s anti-racism and pride in his class is highly commendable, then this experimental flirting with nationalism (whether English, British, or any other) is as dangerous and misplaced as his long-documented support for the Labour Party. While the book is entertaining and worth reading, it suggests that his ‘search for belonging’ that is the book’s subtitle, still has some way to go.